Amble Town Council have the power to maintain bus shelters under Local Government (Miscellaneous Provisions) Act 1953, section 4. The bus shelter at Acklington Road (JCSC) was designed by students and installed by the Town Council. Some of the openings have since been covered in to cut down on the draughts for waiting passengers. It is hoped the metal will have some suitable motif cut outs added in the future. In July 2012 Northumberland County Council transferred responsibility of their bus shelters to Amble Town Council; this included those located at: Acklington Road (South Avenue), Church Street, High Street and Links Avenue. A survey was carried out and repairs were undertaken. The Town Council did not take over responsibility for the shelter in Albert Street near Lindisfarne Road as there is currently no service there. erected a new bus shelter on Acklington Road near the Gloster Park entrance, following requests from the public, with the financial help of County Councillors Robert Arckless and Jeff Watson. the Town Council replaced the High Street bus shelter. commissioned local artist Sarah Holt to paint a mural inside the Church Street shelter. 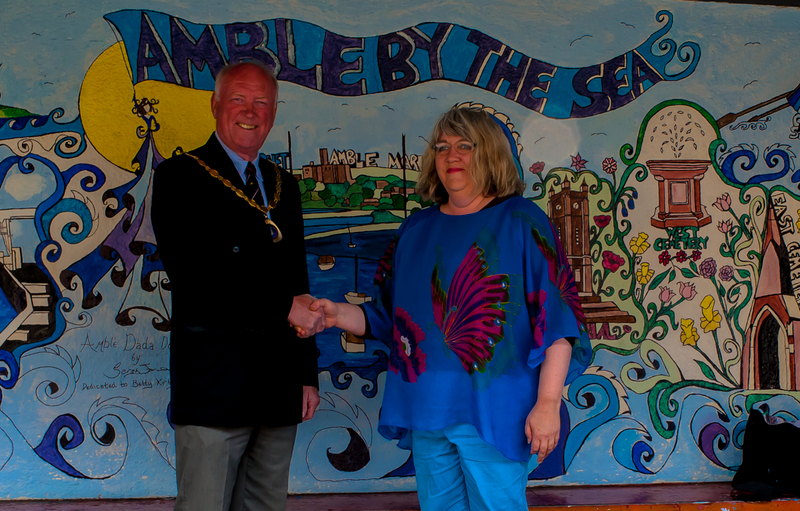 The mural includes the Amble of both the past and the present, painted in Sarah’s own artistic style – ‘Dada Doll’. As part of The Section 278 Agreement (of the Highways Act 1980) Persimmon Homes are to fund the cost of two new shelters; one of either side of the A1068 adjacent to the Mark’s Bridge site. The funds (including 5 years maintenance costs) were transferred to Amble Town Council to be ring fenced for this purpose and the shelters will be erected at an appropriate time in the future should a service operate along that route. Whilst Northumberland County Council are responsible for the bus timetables and cleansing the floors, any damage or graffiti should be reported to Amble Town Council.